You can't neglect your passion any longer. It’s a common mantra among entrepreneurs that to become successful you need to pursue your passion. After all, the entrepreneur’s journey is harsh. You should really believe in what you’re doing to follow through all its ups and downs. But how to find out what you are really passionate about in life? How to choose which path to follow? Which one would lead not just to success, but to ultimate personal and professional fulfillment? A good place to start would be to identify a set of beliefs and first principles that guide your everyday behavior. What do you stand for in life? Figure out what is important to you to have a fulfilling life. After all, not living by your core values might lead to unauthentic behaviors and destructive habits. And this in the end results in resentment and frustration. Think of what is a common central theme behind your behaviors. Then think of words that best represent your values in various settings. For example, if working with others is important to you, you might value Collaboration. When it comes to work, do you value more Excellence or Learning, or maybe both? Does the Variety matter to you in health and fitness, or is it Adventure that you are striving for? What about your personal life? Common behaviors point to principles that make you feel truly fulfilled. These principles are personal values that govern your daily actions. Some of those values might be shared for most of the entrepreneurs and high-performers. Flexibility, cooperation, innovation, personal growth, creativity, excellence, control, determination. If you struggle to identify the particular values that are driving your behaviors, here is a list of over 220 core values to give you more to play with. As all human beings, you want to see others acting according to your beliefs and ideals. When others don’t meet those expectations, sometimes you might get angry or frustrated. But keep in mind that all people do not operate with the same set of principles. Often their behavior is unintentional, so do not take it personally. Passion is not something that is born overnight. There is a big chance that you have somehow manifested your true passion in your past. Think of what is it that you remember doing in the past that you stood out at. Remember something you did because you liked it and not because of a school grade or another reward. Have you tried to launch an educational project with your high school sweetheart? Have you enjoyed volunteering for the people in need? Have you always enjoyed writing, and dreamt of running a newspaper someday? There must be a reason you joined a particular club at university or helped a friend with a campaign. Recall what motivated you to join those initiatives in the past and what parts of the process you enjoyed the most. What values were driving you back then? Most likely, you will notice some patterns there. Try to write down on paper all those things you’d passionately pursued in the past with a brief explanation why. Connecting the dots between your past is a powerful exercise that would bring you clarity and inspiration. The easiest way to enjoy what you are doing … is not doing what you hate (duuuh!). Try to come up with 5–10 things that you would rather avoid doing. At work, it may be calculating expenses or setting up some technical systems. In your personal life, it might be coming up with what to eat or cleaning up your house. Of course, every domain comes with the chunk of non-enjoyable stuff that at times you would still have to do. Your work has tasks you have to do to keep you afloat. Your personal life has chores that you have to do to survive. But once you get clear on what it is you loathe doing, you can lean towards projects that have nothing in common with those things. Now that you know what drives, and what demotivates you, what shall you do next? You need to find or create a project that lets you exercise more of what you enjoy doing and what honors your core values. Most entrepreneurs work on something that is built upon their vision. When you decide on a project, you have to figure out why is it you want to work on it. That why will help you persevere when stumbling on challenges and confrontations. It will also help you inspire others with your work. Leaders and organizations that are good at communicating what they believe in attract others. As an entrepreneur, you have to make others feel like they belong and resonate with your mission. Only when you are open about your values beliefs (the WHY-s), would you be are able to convey the importance of your work and connect with others. Another crucial benefit of a clear WHY is establishing a vision and mission for your project or a company. This is an important part of creating a company culture that would make it work with a unified purpose towards the same goal. Visualization practices have been used for centuries. Studies have shown that approximately 65 percent of people learn best through visual cues. Sometimes, only when you start deliberately picturing how your ideal future might look like, you can truly understand what is it you want to be doing (your entrepreneurial passion!). This way you would also be able to understand what you need to do to succeed. And eventually, you will get there. For entrepreneurs, visualization is one of the most powerful techniques. This life and work design exercise wires your brain to succeed in achieving what you envision. First, you imagine yourself doing something you really love and are passionate about. Then you are mentally preparing for that activity. Then your brain sends a signal to the rest of our body to complete the action. Visualization helps you ‘see’ your future success and motivates you to act towards it. This guided exercise could be one of the most powerful techniques to help you create your ideal future. But to take advantage of it you must devote consistent time and effort to it. To be able to bring your idea to life, you have to keep on envisioning the same picture over and over again. Sometimes people experience difficulty with this exercise because of the attitude that it requires. But if you are open-minded and willing to commit a consistent effort to it, you can find many useful resources on the Internet. Various meditation apps, like Headspace, also provide visualization exercises and build up your meditation habit. I also recommend The 6 Phase Meditation by Vishen Lakhiani. It is a good start if you are new to meditation as it guides you through some simple steps. During the meditation, you picture yourself 3 years from now as well as visualize your journey getting there. Another technique to help you work towards your ideal future is creating a vision board. Vision board helps to narrow down your desires through the power of choice. Here, you have to choose a few images of objects and favorable life and work settings. By narrowing down your focus on ‘how it will look like’, you make the board very personal to you. When your board is in front of you, your subconscious mind channels you daily actions towards your desired future. Looking now at how you want your life to look like, it is now time to brainstorm the next steps. 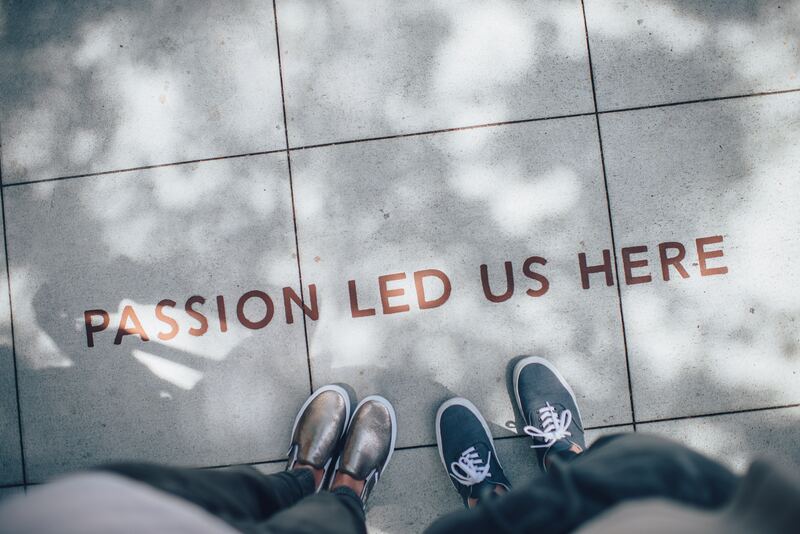 How do you connect your entrepreneurial passion with your career? Here you need to come up with as many things as possible to try that might get you closer to your goal. Those should also be the things that you will feel happy doing. Look at successful people you admire that share your passion. Check what skills they exercise every day to run their businesses. Write down what is their unique know-how. Is it soft skills like communication or public speaking? Teaching and explaining? Or is it hard skills like digital marketing or writing? Programming or design? This will give you a flow of thoughts of what are the skills that you have and enjoy exercising yourself. Write them down. Organize a workshop for refugees or a bootcamp for students who want to learn to code. Start a blog where you share your insights and reflections. Call 10 of your friends to gather to exercise together in a park. Connect these possible projects with your skills. Remember, it is okay not to be perfect at something. It is not okay to find excuses not to exercise something you know you enjoy. Now you are clear on what it is that you want to start and what skills you need for it. What you need now is to stay motivated and keep on leveling up. It is a widespread idea that naturally talented people achieve the eminent performance easier and faster. Biographical research disproves this notion. The maximal level of performance is also not achieved because of how many years you have been in the field. The level of performance increases as a result of deliberate efforts to improve. Only deliberate practice, or training, designed to grow your skill will help you become the best at it. Of course, your perseverance to work on your skills grows when fueled by your passion and your goals. You need enough motivation and grit to always level up while pursuing your goals. Only then you can reach your greatest performance and succeed. The life you want to create won’t happen in one day. There is no magic pill or a fast track to creating a fulfilling future. You have to work on yourself to become very good at something and build up your confidence. And it may take years to develop the needed level of skill. But think of the compound effect. Remember, the nitty-gritty of your present is the foundation for your purposeful future. Start with values and a clear picture in mind. And then eventuate a series of actions working towards your goal. I am on a mission to help high-achievers and entrepreneurs in their personal growth. My insights come from my experience working in the personal growth industry, studies on human psychology, performance and mindfulness, and from my experience living with an entrepreneur (I am an entrepreneurial wife!). If I can help inspire and provide some guidance to high-performers working towards their best selves, I would succeed in making this world a better place. Happy to hear from you! Email me, or say Hi on Twitter. Dedicated to unlocking the potential of powerful human beings and making this world a better place.